Nearly 4.6 billion years ago, the Solar System began forming from a disk of material that surrounded a new star – our Sun. 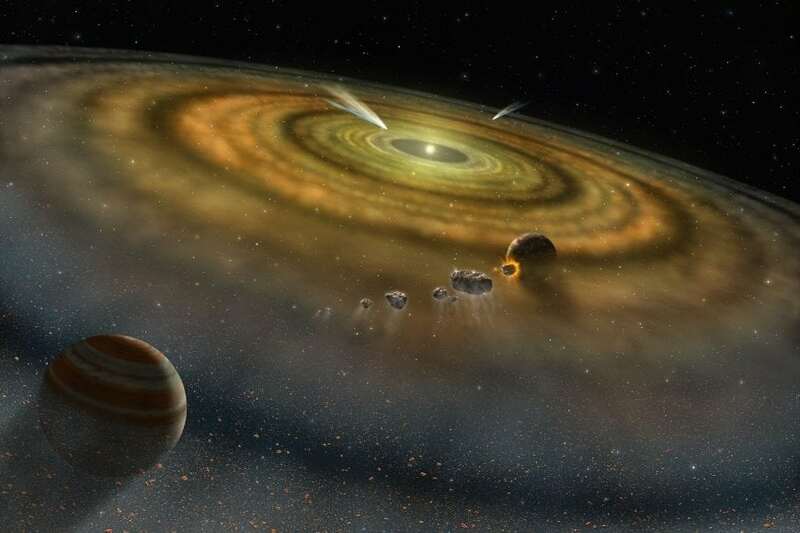 The transition from debris disk to the planets we see is an active area of investigation, but most planetary scientists agree that there was a series of intermediate stages which included the formation and eventual destruction of hundreds of smaller proto-planets. Most were eventually absorbed into one of the eight current planets, but those that escaped this fate were quickly smashed in the pinball-like collisional environment. Some of the debris from this violent period remains in cold storage between Mars and Jupiter – a region known as the main asteroid belt. Of the nearly one million known asteroids in the main belt, we’ve only studied a few thousand in any detail. But this statistical sample, as well as the analysis of meteorites (fragments from the asteroid belt), suggests that they are largely composed of common silicates and include a small percentage of native metal, primarily iron-nickel alloy. However, there are a hundred or so asteroids thought to be dominated by iron-nickel – the so-called M-class asteroids. The earliest, and still most common interpretation of M-class asteroids is that they represent the metallic cores (or fragments of cores) of a few proto-planets that managed to survive after their rocky crust and mantle were stripped away in violent collisions. Asteroid 216 Kleopatra is one of the largest M-class asteroids, as well as one of the most enigmatic in general. It was first tagged as unusual because it’s light curve – a plot of its brightness with time – was found to be highly variable. This suggests an elongate object because the amount of sunlight reflected (and therefore brightness) depends on the cross-sectional area visible at any given time. Unfortunately, asteroids are so small that they cannot be resolved in traditional telescopes. But thanks to radar technology, there is another way to see the shape of the larger asteroids. 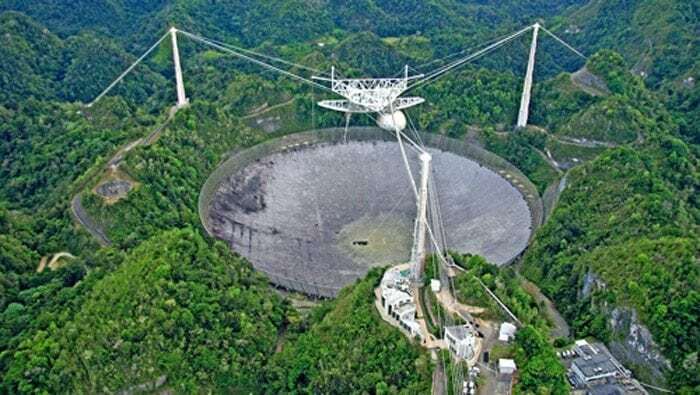 With a megawatt microwave (2380 MHz) transmitter and 300m diameter antenna, the Arecibo radar telescope sends a series of microwave pulses toward an asteroid and measures the arrival time, power, and frequency of the faint returning echo. Slight differences in the echo delay time (on the order of microseconds) are due to its “thickness” (differences in the radial distance, or delay, to different parts of the asteroid), and slight differences in the echo frequency are caused by its rotation relative to the observer (one edge is rotating toward, the other rotating away). These differences are used to generate a delay-Doppler radar image, and with enough images at different aspects, can be used to generate a three-dimensional shape model. In the late 1990s, Kleopatra became one of the first main-belt asteroids to be imaged and shape modeled with radar, and the suspicion that it had an unusual shape was confirmed . Not only was it highly elongate, the analysis indicated a shape like a dog bone! Adding to the intrigue, later observations using the Keck advanced adaptive optical telescope revealed it to have two tiny moons, now named Alexhelios and Cleoselene after Cleopatra’s children. . 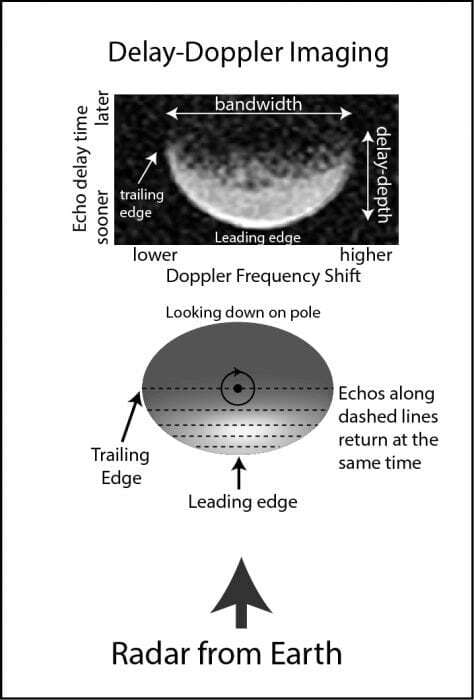 Figure 2: Radar delay-Doppler imaging. A microwave pulse from Earth strikes the asteroid (seen from above in the middle). The echoes return at slightly different times depending on where they strike the asteroid (delay-depth), and at slightly different frequencies depending on the side (approaching or receding) from which they return as the asteroid rotates. These variations are combined into a radar image, shown at the top. Image credit: M. Shepard, Asteroids: Relics of Ancient Time, Cambridge University Press. Used with permission. A more recent analysis of Kleopatra with newer radar data sets at different aspects and five stellar occultations (when the asteroid passes between a star and observer) has refined the shape and found the overall length to be 27% longer than originally thought . It is composed of two nearly identical ellipsoidal lobes connected by a thin bridge of material, with a total length of 276 km. The technical term for such a shape is a contact binary, two separate co-orbiting objects that are touching at the ends. Based on its overall density of 4.9 g cm-3, scientists believe Kleopatra to be a rubble pile – a debris pile (in this case a metallic pile) held together under self-gravity. How does such an object form? 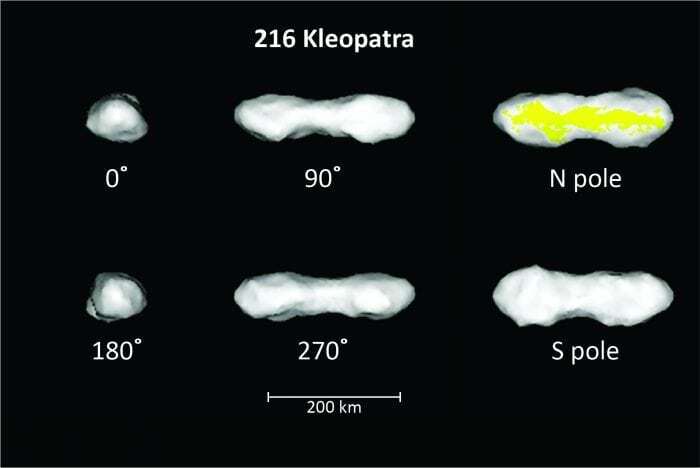 Figure 3: Asteroid 216 Kleopatra observed from all sides. The numbers below each view indicate the center longitude of the view or, for the right column, the north or south polar views. The yellow region was not well imaged. Image credit: Michael K. Shepard. Over the past 4 billion years, every asteroid in the main belt has been subjected to multiple collisions that modified its shape, size, and rotation rate. In the case of Kleopatra, one possible scenario for its unusual shape is that a recent collision was violent enough to cause it to spin up quickly (it rotates once every 5.4 hours), strip away any remaining rocky exterior, shatter its metallic core, and create two moons from some of the debris. While the rocky material was lost, the shattered core reassembled into a loose, gravitationally bound rubble pile. If it were spinning much faster, the two lobes would likely separate from one another, creating a pair of co-orbiting asteroids. These findings are described in the article entitled A revised shape model of asteroid (216) Kleopatra, recently published in the journal Icarus. This work was conducted by Michael K. Shepard from Bloomsburg University, Bradley Timerson from the International Occultation Timing Association, Daniel J. Scheeres from the University of Colorado, Lance A.M. Benner and Jon D. Giorgini from the Jet Propulsion Laboratory, Ellen S. Howell, Michael C. Nolan, and Alessondra Springmann from the University of Arizona, Christopher Magri from the University of Maine Farmington, and Patrick A. Taylor and Anne Virkki from Arecibo Observatory. Bell, J.F., Davis, D.R., Hartmann, W.K., Gaffey, M.J., 1989. Asteroids: the big picture. In: Binzel, R.P, Gehrels, T., Matthews, M.S. (Eds. ), Asteroids II. University of Arizona, Tucson, pp. 921–948 . Ostro, S.J., Hudson, R.S., Nolan, M.C., Margot, J-L., Scheeres, D.J., Campbell, D.B., Magri, C., Giorgini, J.D., Yeomans, D.K., 2000. Radar observations of asteroid 216 Kleopatra. Science 288, 836–839. Marchis, F., Descamps, P., Berthier, J., Emery, J.P., 2008. S/2008 ((216)) 1 AND S/2008 ((216)) 2. IAU Circ., No. 8980, #1. http://adsabs.harvard.edu/abs/2008IAUC.8980. Shepard, M.K., Timerson, B., Scheeres, D.J., Benner, L.A.M., Giorgini, J.D., Howell, E.S., Magri, C., Nolan, M.C., Springmann, A., Taylor, P.A., Virkki, A. 2018. A revised shape model of Asteroid (216) Kleopatra. Icarus 311, 197-2009. Descamps, P., Marchis, F., Berthier, J., Emery, J.P., Duchêne, G., de Pater, I., Wong, M.H., Lim, L., Hammel, H.B., Vachier, F., Wiggins, P., Teng-Chuen-Yu, J.-P., Peyrot, A., Pollock, J., Assafin, M., Vieira-Martins, R., Camargo, J.I.B., Bra- ga-Ribas, F., Macomber, B., 2011. Triplicity and physical characteristics of asteroid (216) Kleopatra. Icarus 211, 1022– 1033. Michael Shepard currently is Chair of the Department of Environmental, Geographical, and Geological Sciences, Bloomsburg University. Michael does research in the Spectrophotometry of Planetary Surfaces, and Radar Studies of Asteroids.